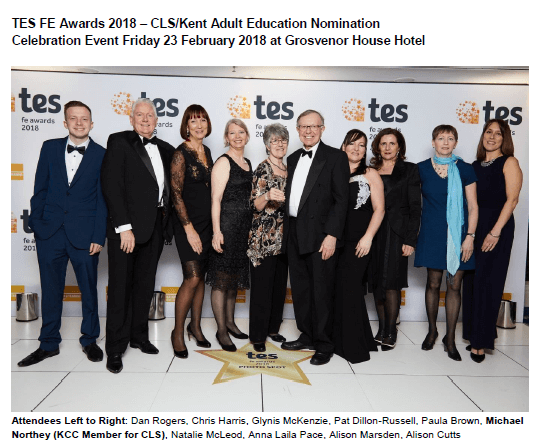 At the end of February 2018 I was delighted to be part of a ‘delegation’ from Kent Adult Education to the Tes Further Education Awards dinner at the Grosvenor House Hotel in London. A wonderful evening and a welcome opportunity for this gardening tutor to scrub up and wear a frock. We were shortlisted in the Adult and community learning category for the Learning Well project, part of a UK wide initiative to measure the benefits of community learning for people with mild, moderate and long term mental health challenges. A range of short courses were taught by Kent Adult Education tutors for partner organisations across the county including Gardening, which is where I came in. I worked with partners ranging from a mental health support group who meet regularly to a housing association new community garden project. All the participants added to their knowledge of gardening but for Learning Well the mental wellbeing benefits from participation in communal learning and gardening are the most important. These benefits include reduction in depression, anxiety, and stress symptoms, increased self-esteem and confidence, social contact and inclusion; and a sense of belonging and personal achievement. Most learners said that they would continue gardening after the course; for some this was a new experience, for others it reinforced interest and confidence to resume or continue gardening living with a life changing health condition. Where groups had access to a garden and would remain together after the course they intended to maintain the area and particularly to grow fresh vegetables and herbs, building confidence and self-esteem through caring for plants and seeing their achievements. The experience of learning and working together was important too, particularly for the learners living with mental health support needs. They reported that it made them feel ‘part of the team’, key for people who often feel isolated from society. Making a contribution to their community also featured and learners enjoyed working in a garden that other people could benefit from. 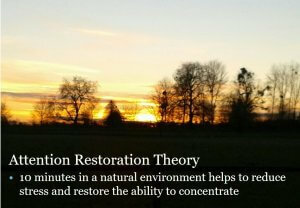 Some learners said that they found working with plants on the course relaxing and helped them to be calm. Others were specific that the practical work required concentration blocking out thoughts of their day to day challenges without itself being stressful. Sadly we did not win the category on the night but all the entries represented great community learning organisations. The whole Learning Well project in Kent was a great success and for me bringing together community, learning & gardening proved a winning combination. I also work independently in Social and Therapeutic Horticulture and would love to help your community or charity realise the benefits of Gardening for Wellbeing. Let’s have a chat! We were delighted to receive recognition through a nomination for the TES FE Award 2018 for our Learning Well Project which measured the benefits of learning for people with mild, moderate and long term mental health challenges. Projects like these are all about teamwork and achievements and outstanding results that come from the commitment of our amazing tutors and staff, and the support from our brilliant partners, some of whom shared the celebration. We were very fortunate to be involved with this pilot to facilitate learning as a means of supporting and improving mental health and wellbeing and our input will soon be published. We have gained huge organisational benefits through this work putting mental health at the forefront of our planning focus, both for courses and staff CPD. We all know how valuable learning is in supporting all aspects of health, and it seems that the wider community and policy makers are waking up to this too, which is great news for the sector. We feel energised and inspired to develop ways to move this forward, working closely with community partners and learners to develop programmes and improve outcomes. “My daughter said I have been a pleasure to live with over the last week and it’s all down to attending this course”, (Art and Craft at Age UK). “During this course I have gained so much confidence, I can now look forward to developing my employment skills. I had barely left my house in the 6 months prior to the course and I am so grateful for all the support and encouragement I have received”, (Teaching Assistant Introduction Course for unemployed mothers). ← What is Soil and what is Soil Improvement?